The purpose of this self-study course is to provide the participant with opportunities to view FEES exams that were completed on patients in rehabilitation settings and practice interpretation and report writing. There is one introductory video reviewing anatomy as it is viewed through the endoscope and one introductory video demonstrating a normal swallow, then 9 patient videos ranging in oropharyngeal dysphagia severity. The participant will watch each patient video, make their interpretation, write a summary, then compare/contrast their interpretation to the example provided. This is a self-guided course, so your responses are only seen by you. There will be the option to view a “hint” to help the participant become proficient in identifying abnormalities on FEES by giving clues of when/where to look at specific areas. 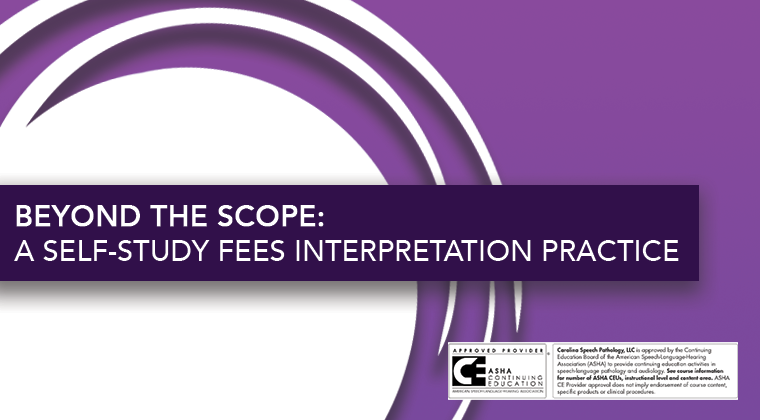 As with anything there will be differing opinions, however, this exercise will familiarize the clinician with FEES interpretation. Prior to completing this course, the clinician should be proficient in adult normal swallowing and adult dysphagia and have taken a FEES training course or equivalent FEES training with a mentor. See ASHA’s guidelines for Knowledge and Skills Required for FEES HERE. Contact education@carolinafees.com to inquire about group rates. Participants must submit the post-test and ASHA participation form within 6 months in order to obtain ASHA CEUs.